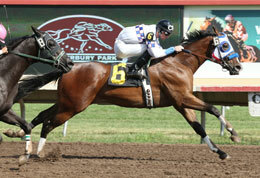 Pyc First Prize Joe defeating fellow qualifier Sportwagon in the NCQHRA Futurity trials at Canterbury Park Sunday. SHAKOPEE, MN�JULY 21, 2013�Leading sire PYC PAINT YOUR WAGON got the top three qualifiers and two of three trial winners on Sunday for the North Central Quarter Horse Racing Association Futurity at Canterbury Park. The 10 fastest 2-year-olds from the three trial races will return to the Minnesota racetrack on Sunday, August 4 and vie for the winner's share of a $45,050 purse going 350 yards. In the first trial Pyc First Prize Joe raced to a half-length win over Sportwagon to set the top qualifying mark of :17.695 seconds, a 101 speed index. Cody R. Smith rode the PYC PAINT YOUR WAGON gelding for trainer Amber Blair and owner Summer Run Inc. Bred in Oklahoma by Weetona Stanley from the Oak Tree Special mare First Prize Joy, it was the second win four starts for the bay gelding. After breaking his maiden at Remington Park in May, Pyc First Prize Joe finished fourth in the Northlands Futurity trials on June 15. He has earned $15,880 this season. First Prize Joy is a half-sister to First Carolina who produced the 2013 $1 million Rainbow Futurity(G1) winner Ms First Prize Rose on Sunday at Ruidoso Downs. The trio of Smith, Blair and Summer Run Inc. came right back in the second trial with the most impressive trial winner Engine Number Nine, who broke her maiden with a three-length win. She posted the second fastest time of :17.775 seconds, a 98 speed index. Alan Woodbury bred the PYC PAINT YOUR WAGON filly in North Dakota from the Special Task mare Cash Task. The aforementioned Sportwagon held for the third fastest qualifying time of :17.776 seconds, a 98 speed index. Also a gelded son of PYC PAINT YOUR WAGON, he is trained by William Harris for owner/breeders Julie and Robert Petersen. Still maiden from four starts he is 0-1-2 and was ridden by Ry Eikleberry in the trials. The Petersen's bred Sportwagon in Minnesota from the Blushing Bug mare Inclinda. Blair also saddled 4th qualifier Teller Toego and 5th qualifier No Secret Faith. The only other trainer with multiple finalists was Bob Johnson who got 8th qualifier Lil Chicks Corona and 9th qualifier Its a Royal Flush. For the complete list of North Central Quarter Horse Racing Association Futurity qualifiers, times, sires, dams, owners, breeders, trainers and jockeys CLICK HERE.